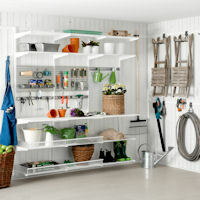 Our unique new WALL STORE system is a simple, neat and attractive solution to organising daily clutter and is designed to help identify the contents of your plastic storage boxes quickly and easily. The system uses a strong metal back-plate which is the only item requiring fixing to the wall. Simply then clip-in the brackets and add our sturdy plastic storage boxes that slide onto the brackets for easy gliding access and visibility of contents. 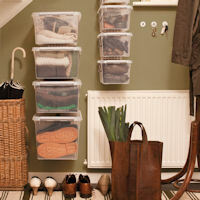 WALL STORE frees-up precious floor space and avoids having to repeatedly unstack your plastic storage boxes to find what you're after at the bottom of the pile. 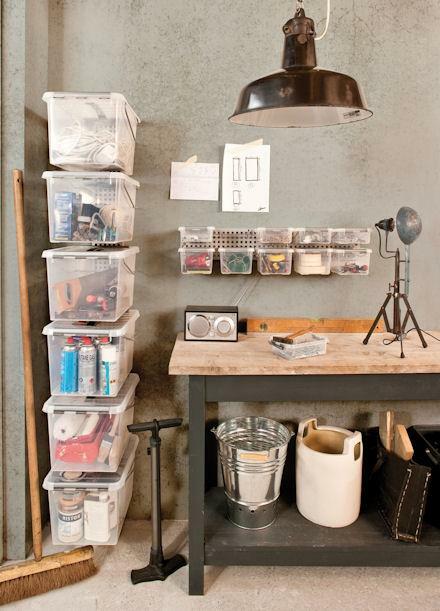 This neat wall mounted garage or workshop storage solution kit includes everything you'll need to create nearly 150 litres of storage split across 16 sturdy lidded plastic storage boxes or various sizes on three back-plates as shown above. Dimensions: This WALL STORE solution can be arrange to suit your specific storage space but will require enough wall space to hold 3 x 80cm long x 14cm wide back-plates and storage boxes. If your available space doesn't meet this criteria, we'd be happy to plan a WALL STORE storage solution for you at no charge, just email STORE via info@aplaceforeverything.co.uk with details or call 0844 414 2885.